Of all the kinds of planets we’re finding around other stars—hot Jupiters and mini-Neptunes and those dubiously called “Earth-like”—super-Earths orbiting close to their stars are among the most abundant. About half of sun-like stars are thought to host planets with radii one to four times that of Earth’s, with orbital periods of less than 100 days. While planets so close to their stars are poor candidates for habitability, they are important to understanding the possibility of other habitable planets in these seemingly common systems. It is thought that, in our system, the big gaseous planets formed more quickly than Earth and its rocky compatriots; it’s reasonable to think, then, that super-Earths will also form more quickly than terrestrial planets in their systems. So a migrating super-Earth, forming out past the habitable zone (HZ) but migrating through the zone to its tight orbit, has the potential to wreak havoc on the formation of Earth-like planets in the HZ. The super-Earth will be fully formed and migrating in while the material that will come to form terrestrial planets—rocky worlds in the HZ—is still in debris, smaller planetesimals, and larger planetary embryos. So we’ve got a super-Earth migrating in from beyond the HZ to a point closer in to its star, basically barreling through the band of material that could come to form Earth-like planets. Is that a problem? A big variable is how quickly the super-Earths migrate. And this ends up being the deciding factor in the fate of rocky planets around super-Earths. When super-Earths migrate inward quickly, they do little to disturb the protoplanets and planetary embryos that go on to form terrestrial planets (see figure). However, slow-moving super-Earths push and pull much of that rocky planet fodder with them into their close-in orbits, depleting the areas where terrestrial planets could form. The authors of this paper came to this conclusion through a range of situations, with varying migration speeds for the super-Earths and distributions of protoplanetary material in the terrestrial zone. They also tested systems with multiple super-Earths migrating inward in sequence, inspired by the Kepler-11 system, which is home to six super-Earth-type planets. The simulations had of two phases: The first phase began with a disk of planetesimals and planetary embryos orbiting within the habitable zone, and one or more migrating super-Earths starting farther out; the outcome showed the super-Earth’s effect on the protoplanetary material. Then, in the second phase, the researchers simulated the evolution of the remaining protoplanetary material to see if, after a few million (simulated) years, the habitable zone had enough material left to form any truly Earth-like worlds. Snapshots of the dynamical evolution of protoplanetary bodies in the presence of a migrating super-Earth. Black dots and outlined circles represent protoplanetary bodies; the big gray circle is the super-Earth. The x-axis measures distance from the star and the y-axis indicates orbital eccentricity. As the super-Earth moves in, the protoplanets remain well-distributed in distance from the star, and only get shaken up into slight eccentricity. So in this case, a fast-migrating super-Earth does no major damage on the distribution of protoplanetary bodies. They found that the mass of the migrating super-Earth made little-to-no difference on the outcome. What mattered was the speed. A super-Earth that took a mere hundred thousand years to migrate in from 5 AU to 0.1 AU scattered or accreted the planetesimals and embryos in its orbit, but the debris didn’t scatter far. Once the super-Earth had made its way through the HZ, 75% of the initial rocky matter had survived, and the subsequent simulation showed the familiar pattern of terrestrial planet formation from that material. A slow super-Earth, on the other hand, does much more shepherding of planetesimals, dragging them with it inward toward the star. The slow migration allows for much of the rocky protoplanetary material to be captured in orbital resonance with the super-Earth, and in toward the star they spiral together. Any migration timescale over a million years leaves much less than one Earth mass of material in the neighborhood of the habitable zone, so much less that in some simulations the HZ was effectively cleaned out. If super-Earth migration is so common, why are all the big planets in our Solar System so far out? Super-Earths are sometimes called mini-Neptunes, too, after all, and our own Neptune is nowhere near a hundred-day orbit. Saturn and Jupiter may have served as buffers, impeding Uranus and Neptune from migrating. 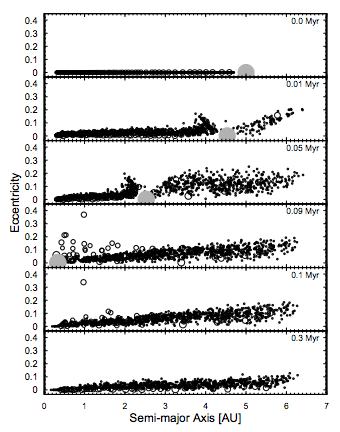 This paper suggests that our Solar System may be atypical. The chance for abundant terrestrial planets in other systems may largely depend on how quickly or slowly those not-so-Earth-like super-Earths migrate.